You have realized, Lee, that your age, experience, skin color, personality, accent, style, saunter, weight, and height, today, are setting you up big-time for the best of your life, while adding considerably to your animal magnetism? We’re talking world tours, Lee, fan clubs on each continent, and a TV show that follows as you create a fabulous business I am passionate about! The two major areas I am working on are loving myself and recognizing my Life Purpose. Sometimes I wonder if I am doing my purpose and I don’t know it. I spent the day with my close friend Kathie who is the same age I am. She was a court reporter for many years, then went into hypnotherapy and now is doing some real estate. She is still wondering what her Life Purpose is as well. I know there are a lot of people feeling that way these days; but having company doesn’t quite help me recognize mine. I have heard the words “find my purpose” a lot, but then others say one creates it. I have been thinking more in terms of recognizing it and creating it – I know I don’t have to know how to do it, just be willing, open and allowing. Maybe I just too impatient for that “Aha” moment of recognition and unfolding. I find myself wondering sometimes “Am I too old?” or “Is it too late?” – ego is working overtime to have me believe it is true. Thanks for sharing, I choose something else. I have always wanted to create something of my own of value but never felt I had. Then it hit me recently, this blog is my creation. No one else could write it they way I do, nor has anyone lived my life. One thing through my marketing expert friend, you may have the same information as someone else, but no one presents it the way you do. That makes you unique. I’ve been reading a book by Richard Moss called “Inside Out Healing”. It has been quite interesting and I find it builds on Neal Donald Walsh’s “When Everything Changes, Change Everything”. In that, Neal spends the first half of his book talking about Past Data – all those beliefs and programs that have been built up over your lifetime. They are not true, but they feel real. That had quite an impact on me – I wrote about migraines a while back and continue to use it. With Richard Moss, he talks about being in the NOW, but in a different way. 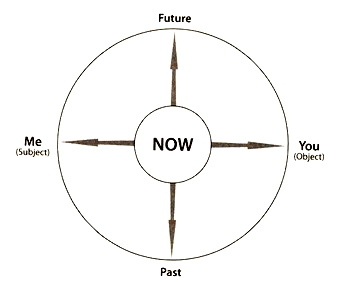 He shows a manual with the NOW in the middle of a circle, with the Future at the top, the Past at the bottom. To one side is Me and the other side is You. The idea is that when you are in the present moment, ego diverts you in one of four paths. It may be the market list you need to make, the stupid things you did, a belief that isn’t true, etc. Or it will go to another person and what they did or didn’t do, either to you or about you. Another path is worry about the future or upset or living in the past. the past week or more I have spent a lot of time at the computer, for work, my blog, Eddie’s Round Up and things he wanted to have typed for exhibits at the Future of Flight. I began to think after the first or second long period at the computer – “Oh s—-! I am going to pay for this either tomorrow or the second day!”. But then I thought “Why do I think that will happen? Just because it has in the past doesn’t necessarily mean it is how it always will be”. I began to realize I had created a belief around that, I can hear myself saying to someone more than once. Yes, it had happened in the past, the belief that when I overdo it, I will pay for it, I have to be careful how much I do. Then I remembered the Past Data loop I had been running for migraines, this was just another Past Data loop about what happens every time I do something and it hits me the next day or the second day. So I told ego, “that is Past Data and no longer relevant and I am choosing something different. In this fresh new moment, I choose filling this moment with good health and well-being in every part of my body, all Past Data is invalid and irrelevant”. How lovely to find the next morning and the mornings after that I was feeling well free of “payback” shoulder pain. Now I am working on the cough that has lingered for 2 years, ever since I had the flu in rehab. It takes time and some days I feel a bit discouraged, but on the whole there is progress. now I am thinking in terms of each fresh new moment and what I want to fill it with when I bring myself back to NOW. This entry was posted on February 16, 2014 at 10:49 am and is filed under Emotions. You can follow any responses to this entry through the RSS 2.0 feed. You can leave a response, or trackback from your own site.